One of two blooming Japanese Aralias. Oh my goodness! 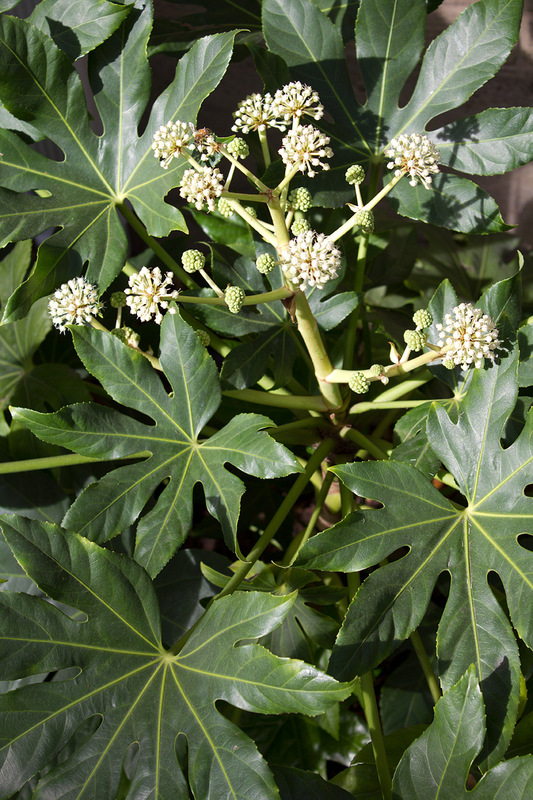 My Fatsia japonica (or Japanese Aralia) is blooming. If you look closely, you can see several bees buzzing around the flower heads. This was planted over a year ago during my backyard’s makeover, and I had no idea that it was a fall bloomer. From a little research, I have learned that these blooms will eventually become “fruiting bodies”—a very fancy phrase indeed. Nonetheless, I expect these fruiting bodies to provide me future Kodak moments. Thanks, Saira. I have two of these aralias, but unfortunately the one planted next to the brick deck has been replaced twice. I have yet to determine exactly why this location is toxic. Since the death throes all occurred during the hottest part of summer, I suspect that location just wasn’t getting enough water. I have since added an additional drip line around this area and just planted the third one two weeks ago. So far, so good.